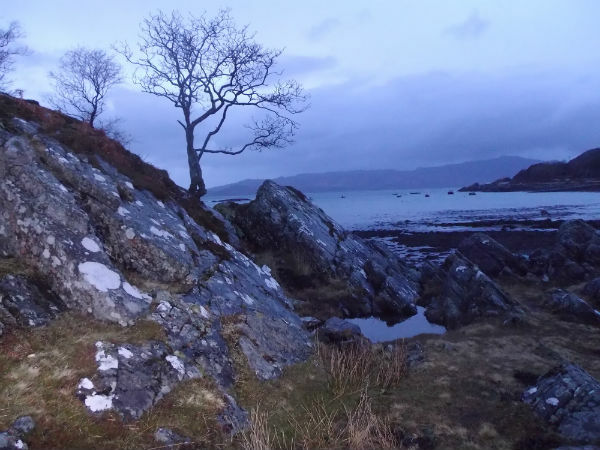 On the shore of Loch nan Ceall on the west coast, Arisaig is a wee village surrounded by superb scenery, white buildings littered between the harbour and the road to Morar. The landscape is a rocky coast, blue seas and white sands and fantastic views out to Rum and Eigg. I dondered around this area for a few days lapping it all up – I want to go back and I will! Arisaig is a village in Lochaber, on the west coast of the Scottish Highlands. The word Arisaig means “the safe place” in Gaelic. On 20 September 1746 Bonnie Prince Charlie left Scotland for France from a place near here following the failure of the Jacobite rising of 1745/6. 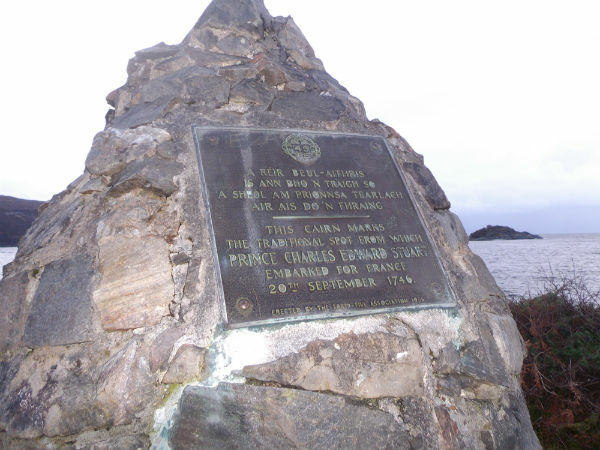 The site of his departure is marked by the Prince’s Cairn, located at Loch nan Uamh to the east of Arisaig, it’s a wee thing, but it’s there for all to see on the main road. Rùm, is one of the Small Isles of the Inner Hebrides, it’s the largest of the Small Isles, and the 15th largest Scottish island, with about thirty people who live in the village of Kinloch. The island has been inhabited since the 8th century BC. From the 12th to 13th centuries the island was held by various clans including the MacLeans of Coll. The island then became a sporting estate, Kinloch Castle constructed by the Bullough family in 1900. Rùm was purchased by the Nature Conservancy Council in 1957. 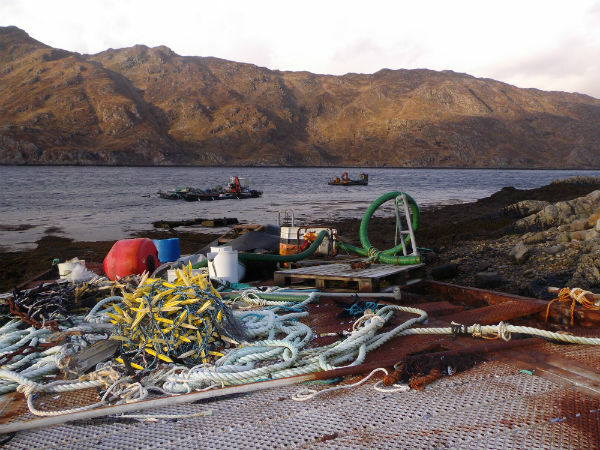 It is now a study site for research in ecology, red deer, and a successful reintroduction of the white-tailed sea eagle. Eigg is another of the Small Isles, lying to the south of the Skye and to the north of Ardnamurchan. Eigg is 5.6 miles long, and 3.1 miles wide. It generates 100% of its electricity using renewable energy. Muck (pronounced ˈelan naˈ) is the smallest island in the Small Isles, 2.5 miles wide and a population of 30, mostly living near Port Mòr. The other settlement on the island is the farm at Gallanach. The island’s only road, is 1.6 miles long and connects these two. A slipway at Port Mòr allows local vehicles to be driven on and off the calmac ferry, which links Muck and the Small Isles of Canna, Rùm and Eigg, with mainland Mallaig. However, visitors are not normally permitted to bring vehicles to the Small Isles. We can also arrange a wee boat from Arisaig! Castle Tioram (pronounced “Chee-rum” meaning “dry castle”) is a ruined castle that sits on the island Eilean Tioram in Loch Moidart, west of Acharacle. Although hidden from the sea, the castle controls Loch Shiel. It is also known to the locals as “Dorlin castle”. The castle was originally a stronghold of Clann Ruaidhrí. Samples free prescription looking to buy viagra buy cialis canada cialis online canada the. Boys and tadalafil therapy for pulmonary arterial hypertension girls with the gospel of jesus christ through. The castle was the home of the Clan Donald descendants four hundred years, the seat of Clan MacDonald of Clan Ranald, a branch of Clan Donald. The castle is now in a poor condition and you need take care when visiting. It can be reached on foot across the causeway, but there is no access to the interior because of the risk of falling masonry. Back of Keppoch is a small settlement close by, just north of Arisaig and south of Morar. Morar (/ˈmɔərər/; Scottish Gaelic: Mòrar) is a small village on the west coast of Scotland, 3 miles (5 km) south of Mallaig. The name Morar is also applied to the wider district around the village. It has a railway station and is on the Road to the Isles, between Fort William and Mallaig. It is famous for Morar Beach, known as the “White Sands of Morar“, which featured in the film Local Hero. Loch Morar, the deepest freshwater loch in Britain, and the River Morar which flows from the loch to the sea. The Battle of Morar was a Scottish clan battle fought in 1602, between the Clan MacDonald of Glengarry and the Clan Mackenzie.